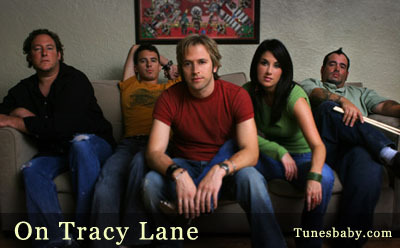 On Tracy Lane, the brainchild of singer/songwriter Darryn Yates, is a modern twist on classic 80s pop rock. Schooled in the vocal stylings of Dave Pirner and Tom Petty, OTL captures the spirit of bands like The Cars while revising their retro sound with driving guitars and lush vocal arrangements. On Tracy Lane has opened for acts such as American Hi-Fi, Local H, Avril Lavigne, Butch Walker and shot a music video in Los Angeles last year for their song “Back To Maybe,” featuring Lacey Chabert (Mean Girls, Party of Five). The OTL live band is Yates on vocals/acoustic guitar, Shannon Nicole - backing vocals, Rick Tschee - lead/rhythm guitar, Jerry McFarland - bass/keyboard, and Chad Shaffer on drums. The OTL EP was produced by Shock City Music, including producers Doug Firley (of Gravity Kills fame) and indie-rock veteran Chris Loesch. On Tracy Lane is quickly catching the eyes and ears of the music industry as they embark on a national tour that will surely have record labels and management companies eager to talk business.